Is it a classic or is it a craze? “Reclaimed wood furniture has become appealing to young families today. The vintage look as well as its characteristic imperfections makes it a popular style for life-and-family proofing. Giving this wood a second life is quite appealing especially when we see the re-creation of beautifully crafted chairs, tables, benches and other unique pieces of reclaimed wood in home designs. I think it will be here for a long time.” Laureen Wilder, Laureen Wilder Designs, LLC. “Reclaimed-wood usage goes back hundreds of years ago in Europe and Latin America. The material was used primarily in rustic service areas. Examples include equestrian, wine-making and general, open outdoor living spaces. Reclaimed wood forever will be a staple in casual design and building. It is the best material to help bring immediate history to new construction projects!” Garison Salinas, Columbus Design. “Reclaimed wood is the way of the future, simply by turning to the past. It allows us to not only to mix old with new, it assists in the "green" design trends. Finding new uses for old wood will remain a classic!” Amena Zamora, Amena Zamora Designs. “Classic. Its neutral color and its ability to be incorporated into any style makes it timeless.” Samantha Furl, Joni Spear Interior Design. “I would have to say “both” on reclaimed wood. With everyone becoming much more environmentally conscious, I can’t see the use of reclaimed wood going away – hence a new classic. 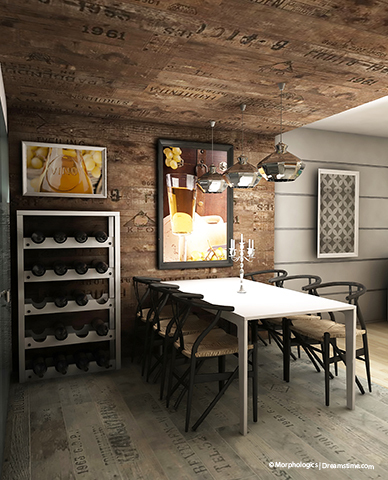 However, the rustic and industrial looks that are so popular right now will eventually fade away, so reclaimed wood used in this fashion is more of a craze. I see it continuing to be used, but possibly in a more refined look, rather than the current rustic look. So maybe that means classic with a twist!” Marcia Moore, Marcia Moore Design.